i have this occasional craving on something that sometimes, it's almost near to the borderline of plain addiction. when i was in college, there was a time when i endlessly salivated for cloud 9. oh wait, the name doesn't seem right. it sounds like a slang name of a stimulant that brings you to the highest clouds. not that i've tried! then when i was already working in my first company, i had also an unexplained hunger for yogurt and it lasted for quite some time. this i shared with a girl colleague. 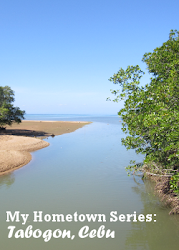 together at high noon, we ventured under the extreme heat of the sun, to the mercury drugstore which sold yogurt at a cheaper price than the nearby 24-hour convenience store. 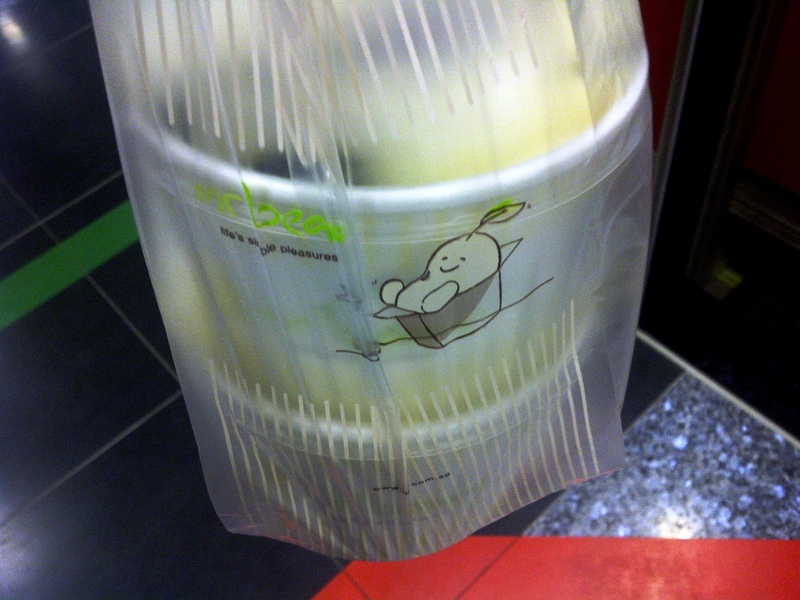 suddenly one day here in singapore, an intense craving for beancurd came over me! 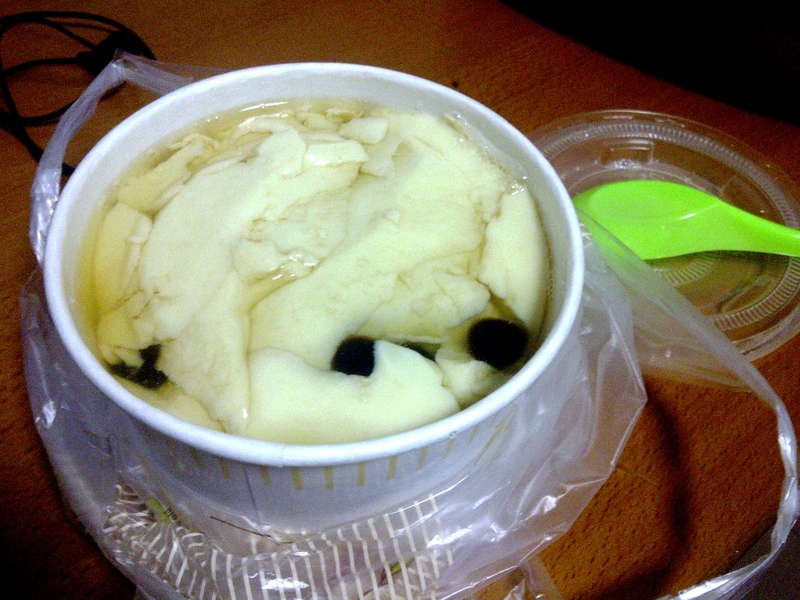 this was my second avail of the beancurd with pearls from jollibean. i guess the lady from jollibean had recognized me from last time and gave me a generous proportion of pearls! at least, that's what i think. i didn't know that there's a stall selling beancurd at the mall near my place. i just believed otherwise after seeing three persons carrying small containers of beancurd in different instances in the bus station. when that fateful day of incomprehensible craving came, i confidently looked for the stall that seems to sell beancurd. alas! i found it in jollibean! although, the name certainly reminds me of jollibee, the famous fast food chain that overthrew ronald mcdonald in the philippines. i accidentally found out about beancurd in mr. bean, a shop like jollibean that sells varieties of anything soy beans. in the philippines, beancurd is being peddled by a man who shouts "taho!!" early in the morning and most frequently, that time when dawn breaks into an early morn. here's a man balancing his two containers of "taho". with no clue that beancurd is the english equivalent term of "taho", i ordered two in mr. bean. i had to exclaim to auntie in mr. bean that i wanted only one as she was about to make my second serving of beancurd. but it was too late, she thought that i only wanted one beancurd with pearls. forgive me of my naiveté and downright ignorance, i now know what's beancurd! LOL from the dictionary definition, it's a cheeselike food made of curdled soybean milk. 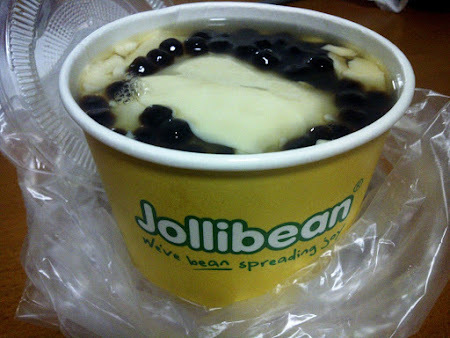 well for me, i like mr. bean's beancurd more than jollibean and i swear it doesn't have to do with their names. 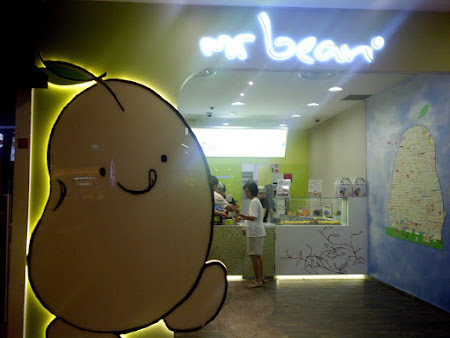 what i like with mr. bean's is that it has the right amount of syrup to sweeten the bland beancurd but i think i just can specify to jollibean that i want one with more syrup. both are selling their beancurds at the same price.